A delightful touchy-feely book with simple, repetitive text. Bright, colourful illustrations with carefully chosen textures to touch and feel on every page. Helps very young children develop language and sensory skills. Series awarded "Best Buy" by readers of Prima magazine. 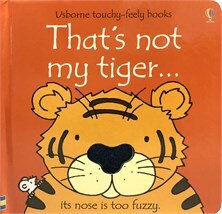 That's not my tiger shortlisted in the Best Books for Babies under one year old category. Colourful and durable! This book has been licked, drooled on, food droppings have been smudged all over the pages, it has survived a trip to Cuba where it got covered with sand and the fatty stains of sunscreen lotion . And still.....it looks good. We had to read and reread and reread... she is 2 and just loves it! Great for occupying time whilst potty training, too!